Classifieds Script can be one of the most useful tools for any webmaster. By running a classifieds site you can automatically generate leads for your programs and also make money from it. Our Classifieds script allows you to run your own classifieds site and generate income from it by selling banner impressions. 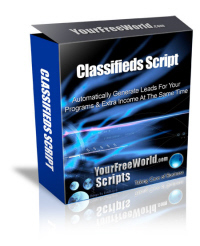 Click here to view Classifieds Script Demo. The design of any HTML pages, including interfaces, must be changed and/or modified by yourself. One License is for a single Domain only. All copyright notices used within the scripts MUST remain intact. For a limited time, we will install this script for you absolutely FREE!